Armenian Y-chromosomes have been a largely ignored since the publication of the classic Weale et al. (2001) paper a decade ago. The Armenian DNA Project has largely covered the void during the intervening years, but it is nice that the topic is revisited by academics. Armenia is sandwiched between Anatolia, the Fertile Crescent, the Iranian plateau, the Caucasus, and the Black and Caspian seas, making the study of Armenian Y-chromosomes extremely interesting for the student of Eurasian prehistory. Gene flow from the surrounding regions may have affected the Armenian population over historical time, but the remoteness of the Armenian highlands, coupled with the national church -- which distinguished Armenians from both the Orthodoxy of the Roman Empire, the Zoroastrianism of the Persians, and, later the Islam of Arabs and Ottomans -- may have prevented it. My comments on the paper will follow below once I read it. UPDATE I: The paper spends a lot of time on analysis of Y-STR variance; my opinion of Y-STRs as a tool for inferring past population movements is, to put it mildly, low. When Bahamian Y-STR variance is higher than African one, and E-V13, one of the youngest European Y-haplogroups (in terms of Y-STR variance) turns up in Spain in one of the earliest ancient DNA samples, it goes without saying that the burden of proof is on those who wish to continue to talk about Neolithic or other population movements to make the assumptions of their models clearer. 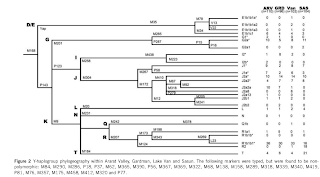 Nonetheless, there is still some utility in Y-STRs, so I reproduce some tree diagrams from the paper (top left), and link to the supplementary info that has a collection of haplotypes that may be useful to genealogists. However, owing to the contentions associated with the current calibrations of the Y-STR mutation rates,32,34,35,41 as well as the limitations of the assumptions utilized by the methodologies for time estimations, the absolute dates generated in this study should only be taken as rough estimates of upper bounds. Indeed. We are at the point where Y-STRs are at the end of their utility, but the replacement technology of extensive Y-chromosome sequencing has not quite arrived in an economical way yet. UPDATE II: I will have some additional thoughts on Y-chromosome distribution in the third update, but, for the time being, the two most important "nuggets" of information are: (i) the unusual haplogroup frequencies in Sasun (high R2 and T), which may be due to a founder effect, but it would be interesting if Armenian historians could find some explanation for their occurrence there, and (ii) the occurrence of R-M269*(xL23) in Ararat Valley. I invite more knowledgeable readers to comment on the issue; the haplotypes are in Table 2 of the supplement. UPDATE III: The ubuiquity of haplogroup G2a in Neolithic Europe, coupled with the absence of other prominent present-day European haplogroups, has important implications about European discontinuity. But, it also has implications about West Asian discontinuity. The Neolithic in Europe arrived by all accounts from either of two principal areas: Anatolia or the Levant. Today, in Anatolia and the Levant, we see a set of haplogroups of which haplogroup J is the most important and ubiquitous one. Haplogroup R1b is also quite frequent in Armenia, the east Caucasus, Anatolia, and Iran, but its frequency drops dramatically to the east and south. And, there is a whole assortment of other haplogroups with varying frequency. Why didn't all these non-G2a haplogroups participate in the early Neolithic colonization of Europe? It could very well be that a very small founder population crossed the Aegean into Europe, one that happened to be G2a-dominated. But, that is ultimately not very satisfying: if there was plenty of J and R1b in West Asia at the time of the Neolithic expansion, why are these haplogroups so conspicuous in their absence -at least so far- from Neolithic Europe? The case of haplogroup J is particularly problematic. If we had to guess, by looking at present-day distribution, which lineage tracks population movements from the Near East to Europe, there is simply no better candidate: every map of this haplogroup, and especially of its J2a sublineage shows an unambiguous pattern of radiation, with a core area consisting of Southern Italy, Greece, Anatolia, West Asia, Mesopotamia and the northern parts of the Levant. All these regions are crucial to the story of the Neolithic, so the absence of J in Neolithic Europe is perplexing. The relative expansion times for haplogroup J2-M172 (Table 4) generally correspond with those yielded for R1b-M343, with the exception of Greece and Crete, which, unlike haplogroup R1b-M343, are slightly older than the dates yielded for several of the Near Eastern groups as well as the four Armenian populations. As mentioned above, I don't give much weight on Y-STR evidence, but observations such as the above certainly add to the feeling of unease that something is not quite right with the default picture of prehistory. Another observation on the Armenian population, is its very low frequency of haplogroup R1a1. Proponents of the Kurgan model of Indo-European dispersals sometimes associate this haplogroup with the Proto-Indo-European community, and it is strange why -if their ideas are right- Armenia is so lacking in this haplogroup, like its Caucasian neighbors. Why would these hypothetical migrants make such a huge impact in faraway India and barely a dent in nearby Armenia? Finally, the occurrence of some I2, E-V13, and, perhaps, J2b in Armenia may point to Balkan contacts. But, when did these contacts occur? Are they traceable to the migration of Phrygians to Anatolia, according to the Herodotean account of Armenian origins, or can they be attributed to later contacts with Greeks or other Europeans? The veil of mystery seems to be raised even higher by every new study: we may be less certain of what really happened today than in the days of happy ignorance, ten years ago. Ultimately it is new data, like the ones included in this paper, that will make every piece of evidence fit, and the grand puzzle of the history of Eurasia will be revealed in all its glory. Armenia, situated between the Black and Caspian Seas, lies at the junction of Turkey, Iran, Georgia, Azerbaijan and former Mesopotamia. This geographic position made it a potential contact zone between Eastern and Western civilizations. In this investigation, we assess Y-chromosomal diversity in four geographically distinct populations that represent the extent of historical Armenia. 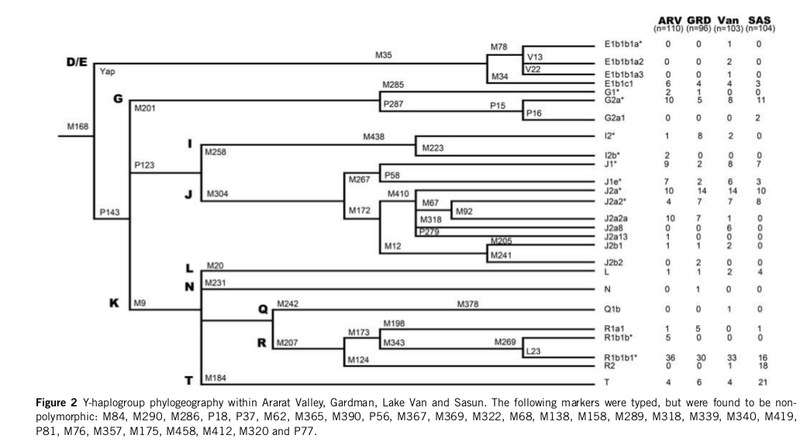 We find a striking prominence of haplogroups previously implicated with the Agricultural Revolution in the Near East, including the J2a-M410-, R1b1b1*-L23-, G2a-P15- and J1-M267-derived lineages. Given that the Last Glacial Maximum event in the Armenian plateau occured a few millennia before the Neolithic era, we envision a scenario in which its repopulation was achieved mainly by the arrival of farmers from the Fertile Crescent temporally coincident with the initial inception of farming in Greece. However, we detect very restricted genetic affinities with Europe that suggest any later cultural diffusions from Armenia to Europe were not associated with substantial amounts of paternal gene flow, despite the presence of closely related Indo-European languages in both Armenia and Southeast Europe. One day, people will know what we would know, but only because we dug for the answers now. They will stand on our sholders and see the world as no one has ever before with bright new eyes. They don't define any subtypes only noting that Y-Hap T is likely to be of Levantine origin...which is interesting. The rest is not too-too surprising. I wish I could read the supplements...my Microsoft Office 2010 SP1 won't open older Office formats...except Office 2007. "The Neolithic in Europe arrived by all accounts from either of two principal areas: Anatolia or the Levant. " Not all accounts. The region north of the Caucasus is also a very strong candidate as an origin of the neolithic, or a very early convert. Fits with the lack of J2 in Europe too. >30% R1b1b1b except for SAS which is T dominated. Fascinating, I wonder what it means. But I am cautious with Y haplogroups these days as they seem to be so volatile. I think we have to go back to mitochondrial groups for deep history. You know what my answer is: because both early neolithic mt-DNA and y-haplogroups in Europe may ultimately derive mostly from just what happened to be present in the northern Balkans / middle Danube, rather than from the handful of people who brought agriculture to that area. For mt-DNA it is reasonable to assume that there was a significant amount of variety available in local groups (and recent finds support this), and more got added during the expansion. Conversely, it is easy to see how a portion of the pre-neolithic Balkans would have been dominated by a particular y-haplogroup - especially one that even today is rather common around the Black Sea. While Anatolia, sitting at the cross-roads and already having had agriculture for a couple of thousand years, at the same time surely would have already had a significant mixture of haplogroups. I also got the idea that the neolithic spread in Europe may have come from the caucases area to explain the high amount of g2 and low amount of j2. But why do you say that area, or I guess north of the caucasus, is a good candidate? I've never heard that theory before. And if it was true then how would you explain the lack of g2 and the prominence of r1 in modern europe? What migration(s) would explain that?
" Proponents of the Kurgan model of Indo-European dispersals sometimes associate this haplogroup with the Proto-Indo-European community, and it is strange why -if their ideas are right- Armenia is so lacking in this haplogroup"
I'm not sure if you mean sometimes "they" associate IE with r1a or if you really mean that some of them associate IE with r1a. Anyways it could be the case that the early indo Europeans were not genetically homogeneous. Maybe the north IE had a lot of r1a and the southern IE had a lot of r1b. Then the northern ie went to India and the southern ie went to Armenia. From the linguistic point of view, there are several layers of loans in Armenian: Anatolian (maybe related to the wave of Balkan immigrants in 2d millenium BC that became Armenians), Urartian/Hurrian (up to 7th century BC), Iranian (200 BC-200 AD) and finally Hellenic Greek. The amount of Iranian lexical loans in Armenian actually exceeds the amount of Armenian-specific inherited vocabulary, so it's here that we may expect the strongest genetic admixture signal. Armenian, Greek, Phrygian (and sometimes Albanian) are usually considered to be part of a separate subgroup which fits with the end of 2d millenium BC emergence of Armenians from the Balkans. The simple reason for the paucity of R1a1 in the Armenians (or related populations) is PERHAPS similar to what happened with the spread of Arabic language and culture. It was a cultural and lingustic replacement with little genetic input...same thing happened in Anatolia several time. Also, one can add the curious case of the Brahui and Balochs...strangely the Brahui are Dravidians and thought to have migrated to their present location about 1000 years ago...The Balochs are Western Iranian speakers, linguistically closely akin to Kurdish populations. The Balochs are thought to have migrated from the west to their present location around the same time frame. This is all relevant because the Balochs and Brahui are genetically virtually the same. The Balochs are only very slightly more cosmopolitan than the Brahui. If the Brahui migrated from Central India then they should have some degree of the components from populations there...they don't. The Balochs have a pinch of it, but not the Brahui. The Indo-Europeans exercised cultural and linguistic dominance over the Hurro-Urartian population. It happened, to a degree, with the Hurrian kingdom, Mitanni, dominant in northern Mesopotamia in ancient times...an early form of Indo-Aryan was imposed was over the local Hurrian language as a superstrate language. I think it is called, "Elite Dominance"? Given the practically continuous tie between Armenia and the Hellenic world in the historical era, the genetic signals are plausibly the remnants of more recent interactions. While the linguistic affinity of Armenian and the Paleo-Balkan languages is notable, the ambiguity regarding the classification of the latter forces us to reconsider the extent and nature of the kinship. In addition, the recent reevaluation of the "eastern Mushkian" ethnogenetic hypothesis emphasizes the mythographic significance rather than the strict historicity of the Greek historiographic account of Armenian origins. From the linguistic point of view, there are several layers of loans in Armenian: Anatolian (maybe related to the wave of Balkan immigrants in 2d millennium BC that became Armenians), Urartian/Hurrian (up to 7th century BC), Iranian (200 BC-200 AD) and finally Hellenic Greek. The amount of Iranian lexical loans in Armenian actually exceeds the amount of Armenian-specific inherited vocabulary, so it's here that we may expect the strongest genetic admixture signal. Armenian, Greek, Phrygian (and sometimes Albanian) are usually considered to be part of a separate subgroup which fits with the end of 2d millennium BC emergence of Armenians from the Balkans. The assumption regarding the prevalence of Iranian borrowings is simply a dated echo of the original classification of Armenian as an Iranian language, demonstrably disproved by Heinrich Hübschmann's identification of Armenian as an independent branch of IE. In his proposed schematic, Hübschmann concluded that Armenian would not merely be an independent branch between “Aryan/Persian” and “Balto/European languages”, but would represent a connecting ring of the two components at a time when they were still very similar to one another as dialects. As early as 1866, Paul de Lagarde organized the detectable Iranian strata into those having a common and native basis, an Old Iranian alluvium and a post-Achaemenid New Iranian layer. Due to the wider-spread familiarity with Persian rather than Armenian, many of the terms were interpreted as New Iranian loans without much convincing philological validation. Furthermore, some of the older borrowings proved to be dubious as well. H. Adjarian's comprehensive and definitive etymological dictionary of Armenian identifies 11,000 root words, 36% of which are borrowings. Of that 36%, only 8-9% is confidently Iranian. In contrast, more than half of the vocabulary (55%) has “undermined” or “uncertain” roots, revealing the fundamental elements of the so-called “Hurro-Urartian” phylum and the subsequent Anatolian languages. Aside from the archeological and logistical discrepancies, the detection of semantically correlated and characteristically Armenian toponyms predating the proposed Balkan timeline leaves the Phrygian hypothesis on quite shaky grounds. FWIW, my best guess (although hardly defnitive) would be that R1b arrives in Western Europe with the Bell Beakers ca. 3000 BCE from somewhere in the vicinity of the Steppes just north of the Caucasus mountains, the community from which they acquired their technology, but to the South of Proto-Indo-European cultural dominance. One of the big questions for Armenia is how much of a demic infusion it acquired in a cross-Anatolian migration from the greater Aegean/Southern Balkan area around 1200 BCE when the Hittite empire collpased, and how much of its is more ancient. Historical accounts of the immediate Armenian region don't begin until much later. The R1b was probably ultimately dervived from the steppe, and plausibly a relatively late contribution. "Why would these hypothetical migrants make such a huge impact in faraway India and barely a dent in nearby Armenia?" Because they were hypothetical and never were migrants. Good to know. Adjarian's dictionary is available only in Armenian, right? But how can we confidently ascertain 1) that "Armenian toponyms" predate "the proposed Balkan timeline" and that 2) “undermined” or “uncertain” roots reveal the fundamental elements of the so-called “Hurro-Urartian” phylum and the subsequent Anatolian languages? If roots are of uncertain origin, they haven't been shown to be Hurro-Urartian. Likely the IE werent interested in the place. The present study indicates that Armenian DNA suggests that most migrations passed the area by. If they weren't interested in the place, then they could not have transmitted their language into a place they weren't interested in. As for Armenian DNA, I don't see any evidence that most migrations passed the area by. Of course Armenia is low on E and I, but neither of those can be linked to Proto-Indo-Europeans, since they are lacking almost entirely in the eastern IE world. "its very low frequency of haplogroup R1a1. Proponents of the Kurgan model of Indo-European dispersals sometimes associate this haplogroup with the Proto-Indo-European community, and it is strange why -if their ideas are right- Armenia is so lacking in this haplogroup, like its Caucasian neighbors. " Possibly because the region was indo-europeanized by an already (long ago) indo-europeanized people (likely coming from the Balkans (there is also a close relationship between ancient greek and Armenian (and they may have an older common source with proto-indo-iranian, that's one common theory anyway))) in which the percentage of R1a1a was very low (or maybe inexistant ?) among the minority of newcomers. It's plausible if they arrived there one or several thousands years after the initial departure froim the proto-indo-european language homeland. Why a so different situation in other part of the world? Different process, different context, different results. "Finally, the occurrence of some I2, E-V13, and, perhaps, J2b in Armenia may point to Balkan contacts. But, when did these contacts occur? Are they traceable to the migration of Phrygians to Anatolia, according to the Herodotean account of Armenian origins, or can they be attributed to later contacts with Greeks or other Europeans?" In their own ancient traditions, the Armenians said they came from elsewhere, why not the Balkans indeed. After all, Armenian is very different of the IE languages that were geographically close to it, like Hittite (itself a very peculiar case, seemingly from an archaic branch and full of non-IE words from Hatti and Hurrian (the latter is from the eastern/south Caucasus region), which is not surprising given its location and could easily reflect population conquest, one way or another (also explaining why the Hittites borrowed most of the Hatti religion/gods except maybe for what seems to be the main IE thundering god that they kept *). * (That's why I tend to assume the IE (proto-Anatolian) population was the dominant (but small) group that was rapidly acculturated and mostly diluted (genetically-speaking) like in the Mitanni case. If the tiny Norman elite could leave such a huge mark in the English language (even in the every day vocabulary), it means it's credible enough. It could probably fit with the apparition of Kurgan-like sepultures a little before 3,000 BCE in the east of Anatolia (like the royal tomb of Uch Tepe and Korucu Tepe) then maybe also with the later north-central Anatolia 13 tombs of Alaca Höyük (ca. 2,350-2150 BCE)?). Besides, the Armenians are at the location of the Urartu kingdom territory which was speaking in an non-indo-european language related to Hurrian (Armenian borrowed several words from Urartians (-> I. Diakonov) and some, such as for instance "brick", "seal", "pomegranate", "plum" or "mint", would rather favor the Urartian language as local, I think, especially since the Urartian texts don't seem to have any proto-Armenian influence in it)). I believe Russian annotations exist as well. The recent work of linguist Armen Petrosyan deals with a number of the toponyms mentioned in cuneiform records, although the author does admit the theoretical nature of some of the reconstructions. Of course, the etymological ambiguities do not automatically make for Hurro-Urartian remnants, yet we must keep in mind that the ‘uncertainty’ was in part the result of Adjarian's relatively limited knowledge of Hurro-Urartian and the general state of Anatolian scholarship at the time. In their own ancient traditions, the Armenians said they came from elsewhere, why not the Balkans indeed. Which ancient traditions? The mythic corpus is wholly endemic and the sole extralocal reference in the Armenian ethnogenetic account is the association of population movements across the southern periphery of the Armenian Highland with the biblical Tower of Babel. All in all, the case for a Balkan origin of Armenian seems strong. "All in all, the case for a Balkan origin of Armenian seems strong." I agree that it's strong and there's some linguistic support for it. I'm not sure that it's proven, though. For instance, Armenian kinship terms, both structurally and formally, don't have much in common with Greek kinship terms. (Kinship terms in any language form a system, hence they are good indicators of historical connections.) Interestingly, some of the peculiarities of Armenian kinship terms are matched by Germanic and Balto-Slavic, not Armenian. E.g., Arm k'eni 'wife's sister' is a unique isogloss with Lithuanian svaine 'same'; Arm ustr 'son' uniquely matches Old English suhtriga 'brother's son' (Greek form for son 'uius has a unique suffix matched by Tocharian soy but not by Armenian); Arm taygr (dial. tek'r) 'husband's brother') closely matches OHG zeihhur and Old English takr because of the medial velar; Arm has a reflex of a widely spread IE root hav 'grandfather' (Hitt huhhas, Old Irish haue, etc. ), while Greek doesn't have a reflex thereof. Alternatively, some old, isolated Greek kinship terms such as anepsios, aelioi have no matches in Armenian. The same can be said of Armenian and Albanian. You can, of course, invent all kinds of scenarios to circumvent this systemic lexical evidence but it's noteworthy that it doesn't support the Balkan origin. I would venture a hypothesis that Armenian is an independent offshoot from the IE homeland in the Pontic steppe. G. Dziebel : "Armenian kinship terms, both structurally and formally, don't have much in common with Greek kinship terms. (Kinship terms in any language form a system, hence they are good indicators of historical connections.)" hmmm... I'm not sure it can be really used as a strong argument *. The ancestors of Armenian and ancient Greek (and I assume, Thraco-prhygian languages) would have separated and evoluted in different local contexts for possibly even more than 1,500 yrs. The fact that there are some words inherited from Hittite in Armenian IIRC, _might_ mean that the ancestor of the Armenian language was already around in Anatolia since maybe at least 1,200 BCE (maybe the arrival of the Phrygians? It's not clear). * E.g. If the English "queen" (cognate with Armenian k'eni, Latvian and Lithuanian svaine, Danish kone, ancient Greek gyne, Russian zhena, Sanskrit jani, Hittite *kuwanz, etc...) could end up meaning what it means today, from "woman"/"wife", then a lot is really possible. BTW, Igor Diakononov had also some interesting ideas associating "Mushki" (an ancient people), "Moesia", "Mysia" and "(sa)mekhi" (designating the Armenians in Georgian) that would all originally point to the Balkans too. "* E.g. If the English "queen" (cognate with Armenian k'eni, Latvian and Lithuanian svaine, Danish kone, ancient Greek gyne, Russian zhena, Sanskrit jani, Hittite *kuwanz, etc...)"
From the perspective of IE historical linguistics, this is incorrect. Arm k'eni and Lith svaine have nothing to do with the IE term for 'woman, wife'. The reflex of IE *gwenH- in Armenian is kin 'woman', not k'eni 'wife's sister'. Semantically, the comparison is tempting, I understand, but phonologically impossible, unless one discovers a sound law that permits the alternation, in certain phonological environments, of k (IE *g) and k' (IE *sw) in Armenian reflecting a similar alternation in PIE. As so often with scientific papers, inadequate attention is given to the sub-divisions of the main groups. Fortunately, better information is available from the Armenian DNA Project. This has a large number of haplotypes, mostly with the full 67 STRs. Their classification has been carefully done and kept up to date. There are also many Armenian entries in Ysearch, many of which are probably the same as those in the project. Altogether, the Armenian amateurs have provided much better information than that available for any of the neighbouring populations. One of the clearest things I have learnt from detailed study of Y-chromosome data is that similar designations can hide very different groups. I think this problem often does not receive enough attention. E1b1b1a1b V13 is the only branch of E found in considerable numbers across most of Europe. 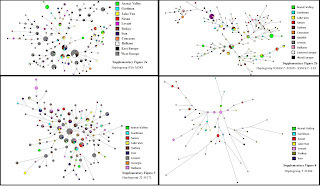 It shows comparatively little variation and evidence of branches concentrated in some regions. There are also a few examples of it in Armenia. 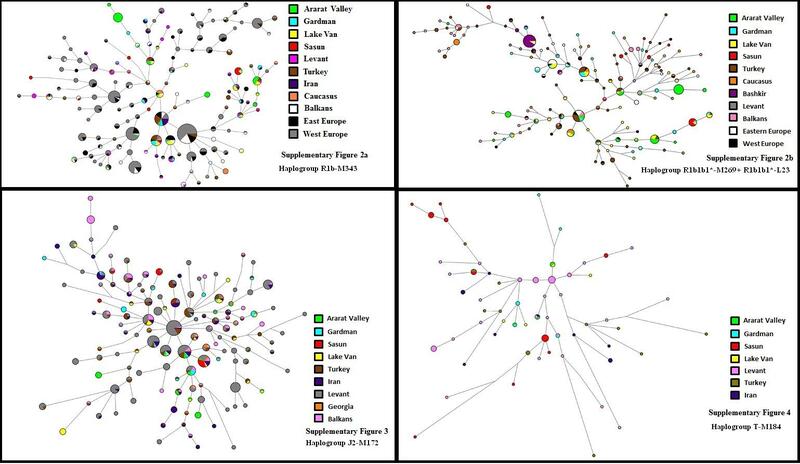 However, the paper, project and Ysearch all agree that the most frequent branch of E among Armenians is E1b1b1c M123. In Europe, this group is found mainly among Eastern European Jews. Halogroup G is a very complex and deeply divided group with many branches both in the Middle East and in most of Europe. Figure 2 of the paper gives only 3 divisions of G, but the project has 14. Many Western European members of G belong to specifically European branches of the haplogroup, especially to a group characterized by DYS 388 = 13 and apparently corresponding to G2a3b1a2 L43/S147. The Armenian project has two G haplotypes with 388 = 13 but they are placed in “G2a3a M406+ L14-“ so the 13 has probably arisen independently here. Figure 2 shows J1 about equally divided between J1* and J1e. The latter is the group that predominates among Asian Arabs. J1* presumably corresponds to the group in the project designated “J1* L136- DYS388 12, 13 or 14” (in haplogroup J DYS388 is usually 15-18). This group is also more clearly distinguished by DYS436=11, DYS490=13. Several sources suggest that this group is mainly responsible for the high frequency of haplogroup J1 in and near the Caucasus. It is also widely but very thinly scattered across Europe. I think it is surprising that this group still lacks an SNP and a proper designation. J2 is another very complex and deeply divided group. Figure 2 divides it more than the other groups, but about half are only designated “J2*”. The project has about 23 sub-divisions of J2. Among them, J2a3b is divided into J2a3b1 M92 with DYS425=null and other parts with DYS425=12. The paper, the project and Ysearch all agree that both groups occur in significant numbers among Armenians. However, in Europe, the 425=null group is found mainly among East European Jews, while the 425=12 group is found mainly in the west. There seems to be much less evidence of Western European branches of J2 than in the case of G.
The representatives of haplogroup I are mostly designated “I2*” in figure 2. They presumably correspond to the 14 members of “I2c P215+ L596+ L597+ P37.2- P217- L416-“ in the project. This separate branch of I2 has only been added to the ISOGG list this year, although Ken Nordtvedt recognized it a few years ago on the basis of STR data. It is especially characterized by DYS490=13. (Other STR figures clearly distinguish it from the above mentioned J1* group with 490=13). This group has been found in various parts of Europe, but it seems to be more common in Armenia than anywhere else. Haplogroup I is found mainly in Europe, but its relationship to haplogroup J points to a Middle Eastern origin. I think the ancestors of I2c could have stayed in the Middle East, when the ancestors of I1 and I2a went to Europe. The former I2b is now considered part of I2a. A new I2b has been defined but it seems to be extremely rare. The branches of haplogroup I are very deeply divided from each other and their distribution is very strongly regionalized. This suggests that I is the oldest haplogroup in Europe. You never imagined the opposite scenario ? As we know that the oldes temple of Greeco-Roman style is found in Kingdom of Ararat(Urartu). Which account? That Phrygians and Armenians were wearing the same military costumes? So according to this logic today's Georgians are Anglo-Saxon as they wear american army uniform. And Herodotus was not called a father of lies, especially for his fairy tales on Alans? The kingdom of Armenia is attested in 3rd Millenia BC by Akkadian Emperor Naram Sim. In fact in Behistunian Inscription it's clearly written that Urartu in Assyrian is Irmina in Persian, and as you must know all the kings of Ortonid Dynasty are the desendents of so called Urartian kings, so who were these invaders, and how they get managed to annihilate a people a become to a power when so called Urartians were invaded by the Medes? maybe because their were already people living on the armenian highlands? and they kindly forcefully asked the migrants to go elsewhere? I mean we are talking about Urartu lateron, it must have been an interesting place. It was populated with warrior people who battled mighty assyria. and you know what a monster assyria is. Dienekes, could you, please, visit the page below and see if it can help solve the genetic phenomenon of the Armenians of Sasun (the existence of the haplogroups T and R2)? The presence of T in Sasun is probably the consequence of ancient Assyrian influx in the region. According to oral and written traditions, Sasun Armenians are descended from the sons of King Sennacherib of Assyria who fled there after killing their father (the episode is also in the father). The name Sasun itself, abbreviated from Sanasun, is derived from the name of one of the sons, Sanasar. Also, some remnants of the Assyrian army took refuge in Sasun after the fall of the Assyrian capital, Niniveh in 612 BC and the end of the Assyrian empire. What R2 represents, I don't know. Dogs domesticated in East Asia after all? Splits or Waves? Trees or Webs?